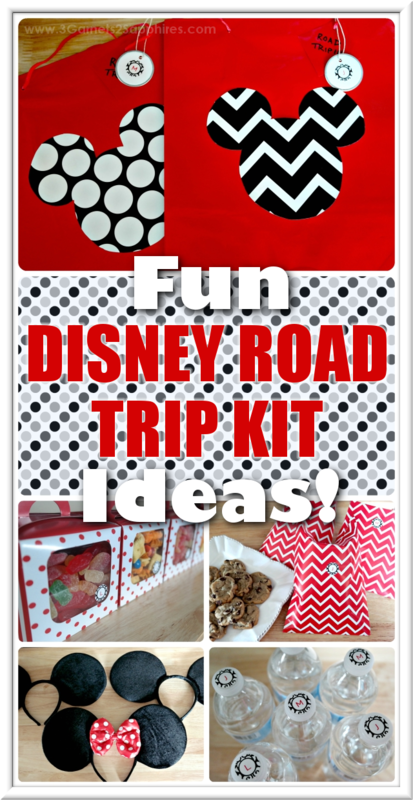 This Disney Road Trip Kit project was sponsored by Oriental Trading Company. All opinions expressed are my own. Last month, our family of 5 took a family road trip to Walt Disney World in Orlando, Florida for the very first time! Not knowing when we'd have the chance to make this trip again, I knew I wanted to make it as fun and memorable as possible for my children. The ride was two days in the car each way, so a Disney Road Trip Kit for each child seemed like just the thing to make the ride more enjoyable. Before I got started, I checked out some Mickey Mouse party supplies for inspiration. Are you planning on hitting the road to Disney? 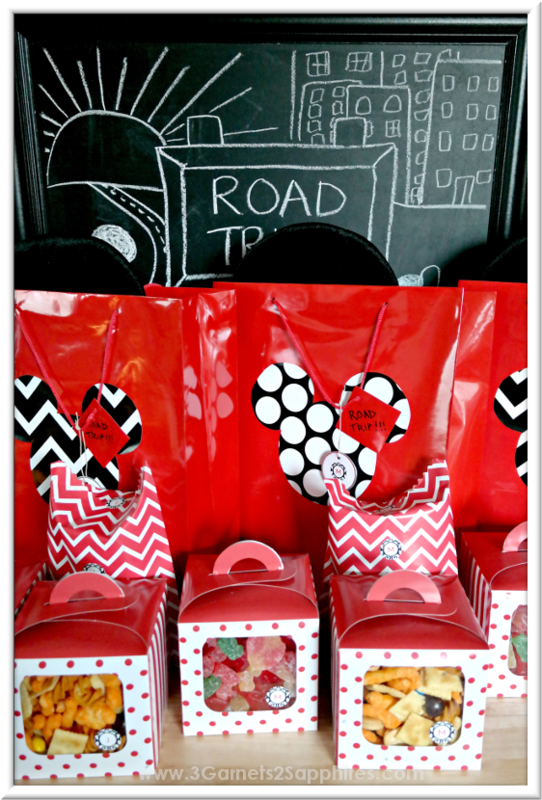 Here's what you'll need to make some Disney Road Trip Kits of your very own . . . Step 1. 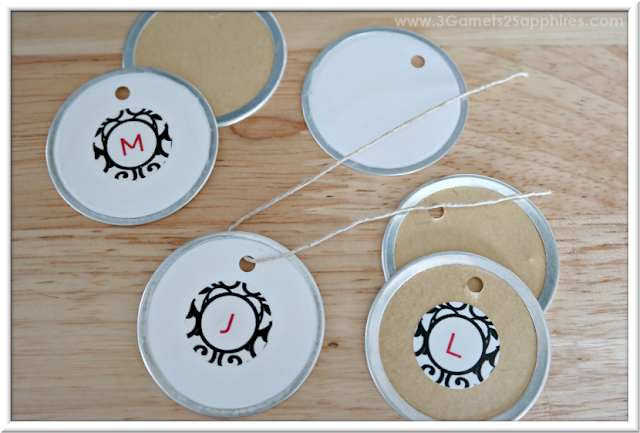 Get your hang tags ready. With the hole at the top, place one monogrammed sticker centered on the front of a round hang tag. 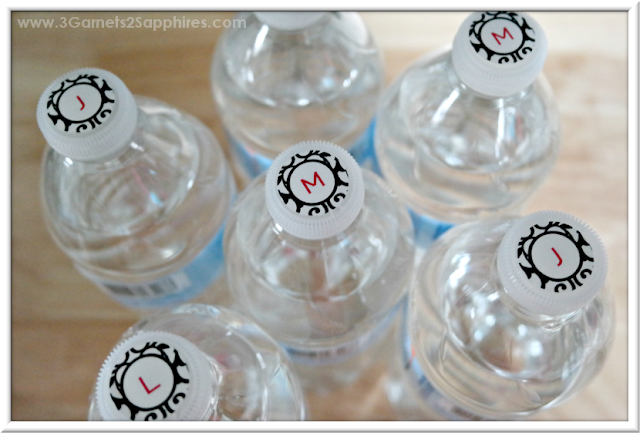 Then repeat with another sticker (same monogram) on the back. Step 2. Find a free printable mouse head template online. 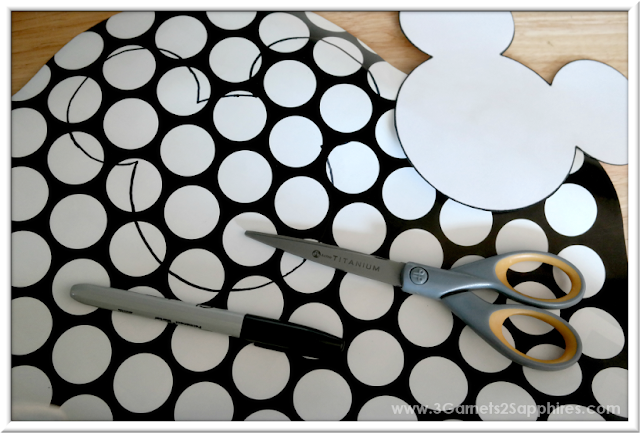 Print out the template and cut out the mouse head shape with scissors. Then, with the desired pattern facing down, trace the mouse head shape using the template and a thin marker right on the table runner. Step 3. Cut out the mouse head shape on the patterned paper with scissors. 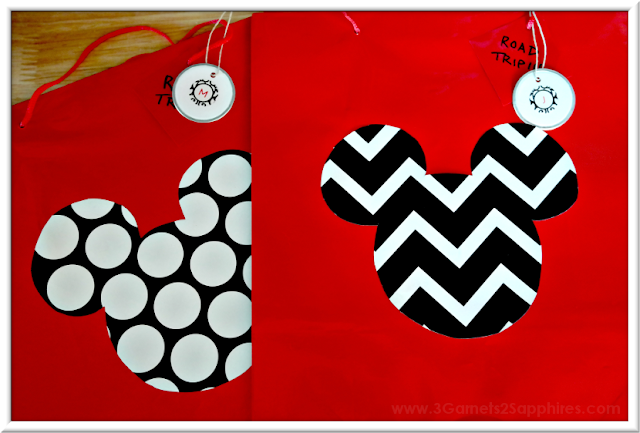 Affix the mouse head with the preferred pattern facing up onto the front of a large red gift bag using a glue stick. Press firmly and allow to to try completely. Step 5. Use the remaining monogrammed stickers to label goodies and water bottles for each each child. We filled these cake bags with mini homemade chocolate chip cookies, using one monogram sticker to keep each bag closed, and another to identify whose bag it is on the front. 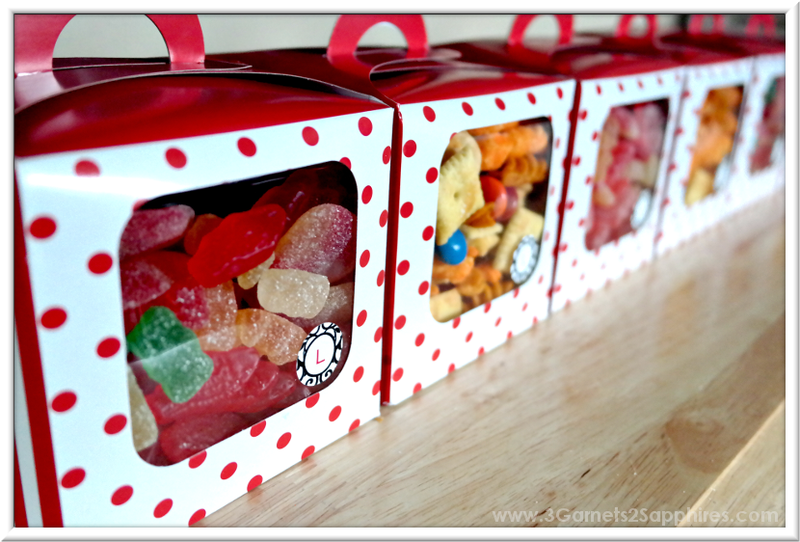 We also labeled one box of savory treats and one box of sweet treats for each child with the monogrammed labels. TIP #1: If you expect the treats will not be consumed within a day, it would be best to place the treats inside a sandwich bag prior to placing inside the box to maintain freshness. Now our basic Disney Road Trip Kits are ready to go. 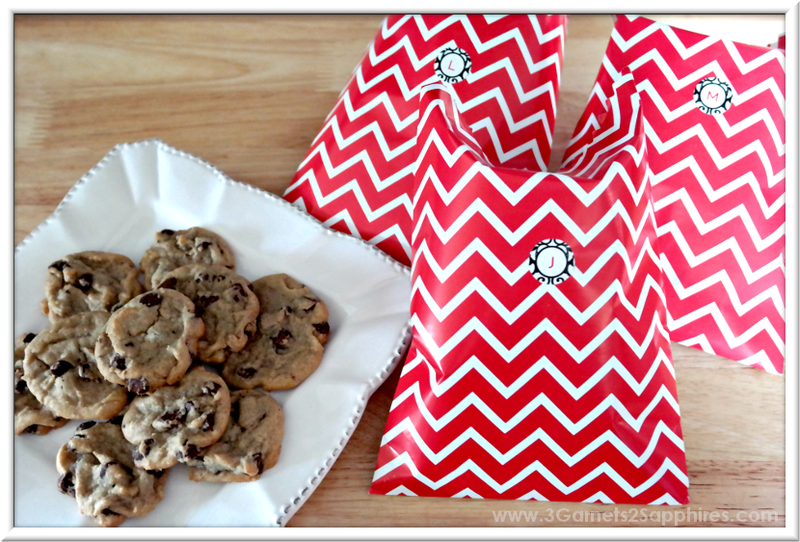 What fun items would you add to personalize these kits for your children? 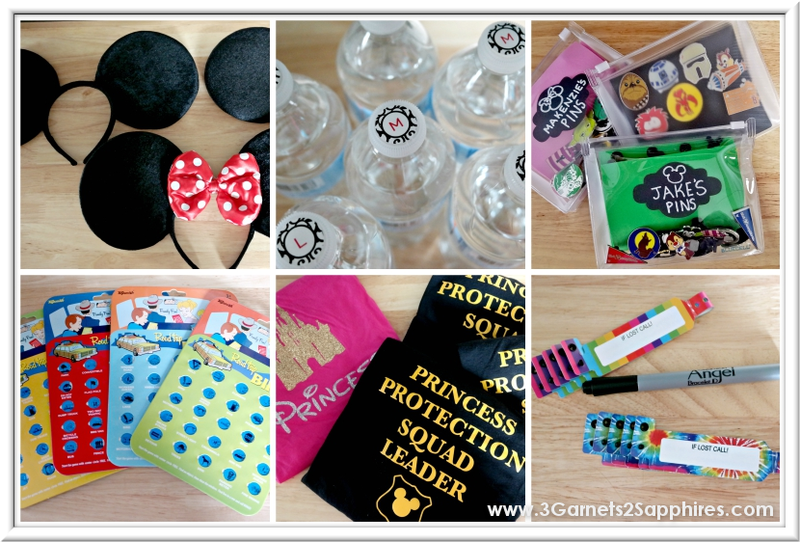 Here are some things we added to our children's Disney Road Trip Kits . . . I think it's safe to say that my daughter's favorite parts of the road trip kit were the mini chocolate chip cookies and the pin trading pouches. Her two brothers ended up sleeping for quite a bit of the car ride to and from Disney. Like this Disney Road Trip Kit idea? Pin it for later . 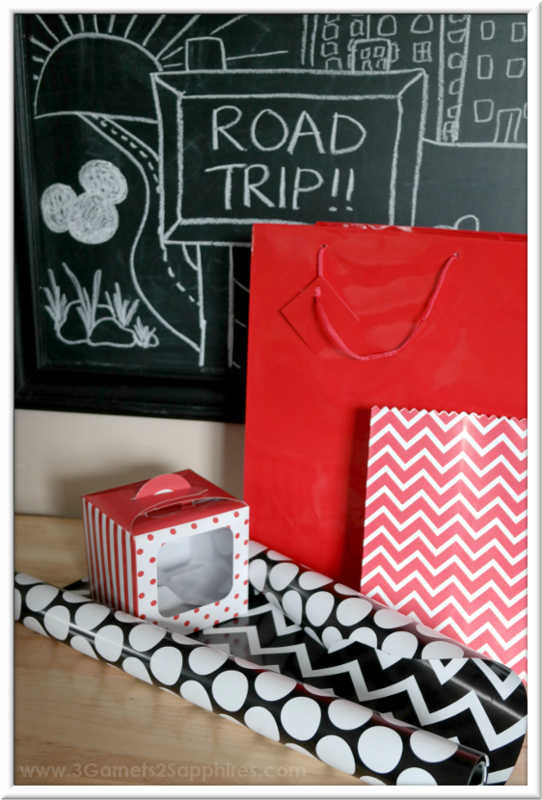 . .
What kinds of surprises would you include in your children's Disney Road Trip Kits? Tell us in a comment here.